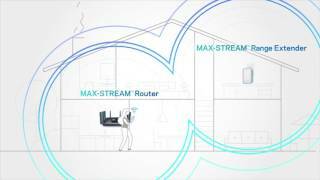 Linksys RE7000 Max-Stream™ AC1900+ WiFi Extender is rated 4.2 out of 5 by 136. Extend your home WiFi to hard-to-reach locations in your home such as your backyard, garage, or bedroom so you get AC1900+ WiFi speeds to Smart TVs, Blu-ray Disc players, iPads, tablets, laptops and smartphones to enjoy streaming 4K / HD movies, simultaneous online gaming, social media, and more. The AC1900+ Range Extender offers Seamless Roaming as you move around your home when linked with a Max-Stream WiFi router. With Seamless Roaming, your enabled wireless devices will automatically switch to the strongest WiFi signal, so you won't have to manually connect to the router or range extender when you move from one room to another--or even to your backyard. ** This means that you can move freely throughout your home while video chatting or streaming videos without experiencing dropped calls or buffering. This range extender is compatible with any WiFi router, including those from Internet service providers. There's no need to adjust your router's settings when installing the extender. Connect a game console, Blu-ray player, or Smart TV to the AC1900's Gigabit Ethernet port to enjoy WiFi up to 10 times faster than Fast Ethernet. You can configure the RE7000 range extender to act as an AC access point to extend your home WiFi and reduce dead zones. Access Point Mode allows you to add WiFi capabilities to your existing home wired network. Simply connect the AC1900+ range extender using a Gigabit Ethernet cable to your router or other wired Internet adapter, and place the RE7000 where you need a WiFi boost. Rated 5 out of 5 by GrandMasterB from So much better than I expected. I originally got this for my shop/garage at home. We've got a really nice Linksys home router already but do get a lot of interference out by the road/where the garage is. This little range extender really surprised me. It doesn't have directional antennas like the RE6700 has but that didn't stop it from extending the signal so far from my house that I can stay connected all the way to the gas station at the end of the road and even almost across the street to the hotel on the other side of the highway. The RE7000 has absolutely incredible range. So much that I took it to my 25,000 square foot tool shop instead to improve coverage and got the smaller RE6700 for my garage at home. Rated 5 out of 5 by Todd from Great little Range Extender... I got this for free as a Beta Tester. Ive always been curious how well these extenders work. This little guy, was a breeze to setup and added a good 30 ft onto my 5GHz wifi signal... Its also nice that its a Dual Band extender, so it'll extend both 2.4 & 5Ghz WiFi signals in your home network. Seeing as I have this paired with a Linksys EA9500 router, this just extends my Dual band WiFi signals nicely. I connected the RE7000 to my wifi via my tablets wifi signal, and used the browser based setup. I prefered this methed vs. Wifi push button, as theres no need to setup more passwords to connect to the RE7000. This way it just purely extend my WiFi signals. Rated 5 out of 5 by Pitboss56 from True Plug and Play! My pool and deck is located behind my detached garage. I have limited wireless Internet access in my garage, and none on the deck. I selected this product to try and extend my wireless access to the pool deck. Setup couldn't have been any easier. I followed the instructions, which consisted of plugging in the extended and pushing the two WPS buttons (on the router and the extender) twice, to be able to use both the 2.4 and 5 GHz networks. I moved the extender out to the garage and plugged it in, waited until I got a steady green light, and then went out to the pool deck to check the wireless signal. A solid 3 out of 4 bars! I couldn't be happier. I would highly recommend this product. Rated 4 out of 5 by Jim Gumby from Range Rover While the initial setup was slightly problematic, the performance and range improvements are undeniable. Two options are available for setup. My first attempt was website based. The process begins with plugging in the range extender and allowing it to go thru its initialization sequence. Next you log onto a network that is generated by the device. You then go to the linksyssmartwifi website to complete the setup. It was during the third leg that setup struggled. The device would lose communication with the network and freeze or terminate the process. The other option which is much simpler requires pressing the WPS buttons on the range extender and existing wifi router in the proper sequence and timing. This is not only much simpler, but trouble free as well. Once setup, the device performed flawlessly and provided improved coverage and performance. The device adopts an address name with the syntax "yournetworkname_ext." Rated 5 out of 5 by Napoli from Excellent Range Extender My wife has been complaining that the WiFi doesn't work well in our bedroom which is on the opposite side of the house from the router (the excellent Linksys EA7500). Set up of the RE7000 was a breeze, you just push the WPS button on the router and then the extender and they synched together within seconds. I then logged into the setup page of the extender through my browser to make sure that the extender was in a good location. The WiFi issues in my bedroom were resolved. I happened to call Tech Support because the 5 GHz network (which I never use) didn't sync probably. I had to change a couple of settings on the extender and it then extended the range of that network as well. I love this device! Rated 5 out of 5 by robertes42 from Easy setup and range ext to all of back/front yard The free RE7000 Max-Stream™ AC1900+ Wi-Fi Extender was sent by Linksys for a review. Followed easy to understand setup instructions using Wi-Fi Protected Setup (WPS). 1. Plugged the range extender in to a nearby outlet and waited for the indicator light to blink orange. 2. Pressed the WPS button on my Linksys EA7500 Max-Stream™ AC1900 MU-MIMO Gigabit Router, then pressed the WPS button on the RE7000 router. 3. A 2.4 GHZ connection was created using main network name + _EXT. Entered my router PWD to connect the RE7000 to Linksys EA7500 Max-Stream™ AC1900 MU-MIMO Gigabit router. 4. Repeated steps 2 and 3 to create a 5 GHZ connection. 5. If the signal is not very strong you only need to move the extender to an outlet closer to the router and repeat steps 2 and 3. After the RE7000 is connected you can plug the extender into an outlet farther away from the router. The RE7000 remembers router settings for 2.4, 5 GHZ networks, so if you need to move the extender you do not need to reconnect to your router. You only need to plug the RE7000 into another outlet. Rated 5 out of 5 by T3ch5upp0rt from Great Range Extender !!! Having a background in network engineering I have used many Linksys products over the years and they have never disappointed. Also, throughout the years I have never been a huge fan of WIFI – until recently. Let me say upfront, I use Gigabit Ethernet to my media server, NAS, Desktop PC’s and Roku (but I believe the Roku has a 100mbps port). I my opinion, NOTHING replaces the wired connection. Still, no one in the house wants to connect to the wire on their phones, tablets, iPad, iPod and laptop, so WIFI is a necessity. My WIFI is provided by my Centurylink Prism residential gateway, which is installed in the structured panel in the wall of my house. Not the best setup for performance, but easy for the tech that does the install. I found it frustrating that the wireless signal could not carry across my house, or out to my patio. The signal would usually register as POOR and connection speed was 5 – 9 mb. After installing the RE7000, the wireless signal in my bedroom and patio is consistently registering EXCELLENT or GOOD, and connection speed averages 65 – 72 mb. If you are looking for a wireless range extender, there’s nothing simpler, better or easier to use. The range extender configuration is as follows: If you have a ‘newer’ router with a WPS button this process could not be easier: Step 1. Take unit out of box and plug it in. Wait for the LED to start to blink Orange (could take up to a minute) Step 2. Push the WPS button on the RE7000, hold it for a couple of seconds. Push the WPS button on your wifi router (hold it for 5 seconds). If the LED turns solid Green the connection was successfully paired. At this point you have paired the RE7000 to your 2.4ghz wireless network. If your router has a 5ghz band and you want to extend that network also, you repeat the same process again. Truly a 2-minute process. If you are using a router without a WPS button, the browser based setup instructions provide the steps to manually configure the Linksys RE7000 as a WIRELESS or WIRED range extender. Testing the unit found no loss in download speeds (20mbps) both using the WIFI extender (across my house and out in my yard) and without the WIFI extender (standing tin the same room as my router). This is a noticeable improvement over an older WIFI extender that boosted the WIFI signal but DID cut the download speed by 40%. This unit was tested with 2 Android phones, an iPhone 6, an Android tablet, an iPad Air and 2 laptop computers. There were no issues with any of the devices. I recommend this product for your home. If you found this review helpful, please give it a helpful vote.